Abstract. In this article, I discuss the main approaches to resampling variance estimation in complex survey data: balanced repeated replication, the jackknife, and the bootstrap. 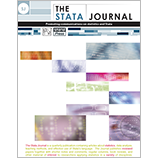 Balanced repeated replication and the jackknife are implemented in the Stata svy suite. The bootstrap for complex survey data is implemented by the bsweights command. I describe this command and provide working examples. The weights created by the bsweights command discussed in this article are equally applicable with the bs4rw command and with the new vce(bootstrap) and bsrweight() options of svy and svyset.